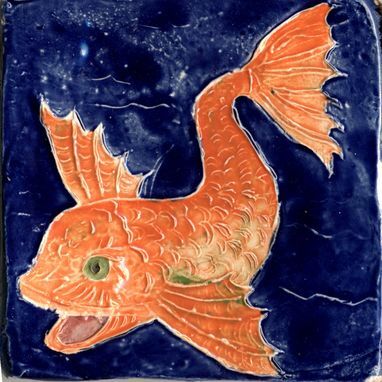 These handmade tiles are inspired by designs by British tile maker, William De Morgan (1839-1916). De Morgan was a friend of William Morris, one of the founders of the British Arts & Crafts Movement. De Morgan designed tile for Morris & Company from 1869-1872, before setting up his own pottery works. De Morgan's designs were mostly two dimensional -- I have interpreted them as three dimensional relief tiles made in porcelain. 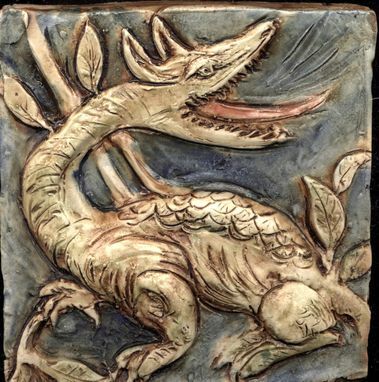 Shown here are two of his most popular motifs -- dragons and fish. They are available in a brown stain or in a variety of custom colors. 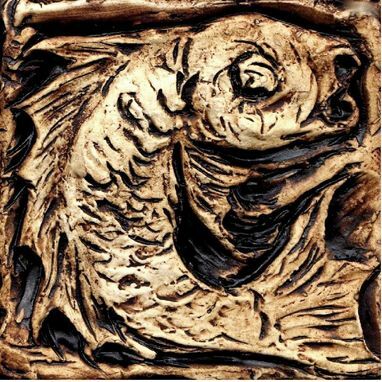 Dimensions: The Dragon is available in 6 x 6" and 4 x 4"; the fish in profile is 4 x 4"; the the swimming fish is 6 x 6". Please contact me for custom sizes and designs.